Great! Now where's that big Star Destroyer they teased us with so long ago? Enough with these tiny micro-machine kits, I don't need another bbroken golf ball, give me a decent sized SD!!! EDIT: For those that don’t bother looking back at recent previous page posts Bandai OFFICIALLY announced the 1/72 B-Wing coming in August. YESSS!!! I never thought of that. THAT would be the reason to buy those tiny models. Get Bandai on that right away Chris! Looks beautiful, but that's a pricey hunk of plastic compared with all the other fighters. Would love to see a comparison pic between that and the other kits, to gauge the size. Also, I hope the stand mount is compatible with some of the other display bases, because that new stand design will be an eyesore alongside all the other kits. 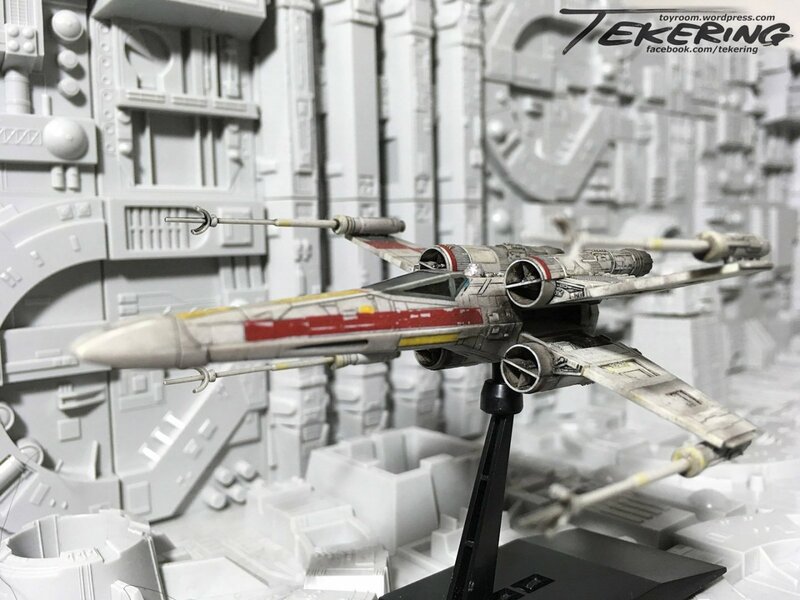 Edit: Assuming Bandai's not making a new laser effect mold just for this model, and extrapolating based on that, looks like this should be between 24 and 27 cm from the cockpit to the end of the main wing. 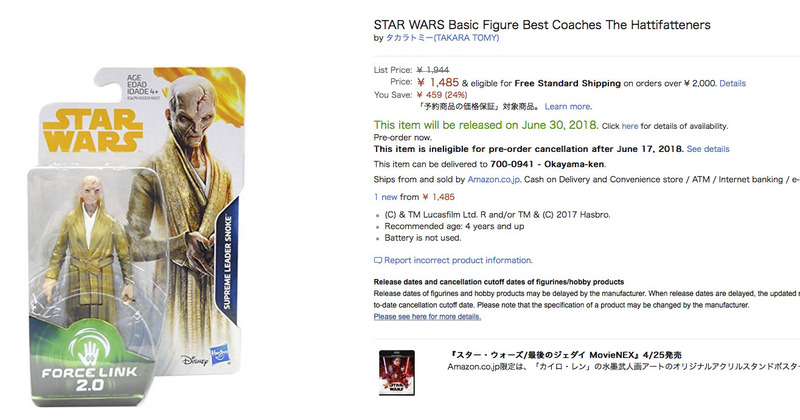 Just a hair bigger than the Y-wing, which should match up with the "canon" lengths that Bandai seems to be following (16.24 for the Y-Wing, and 16.9 for the B-Wing). 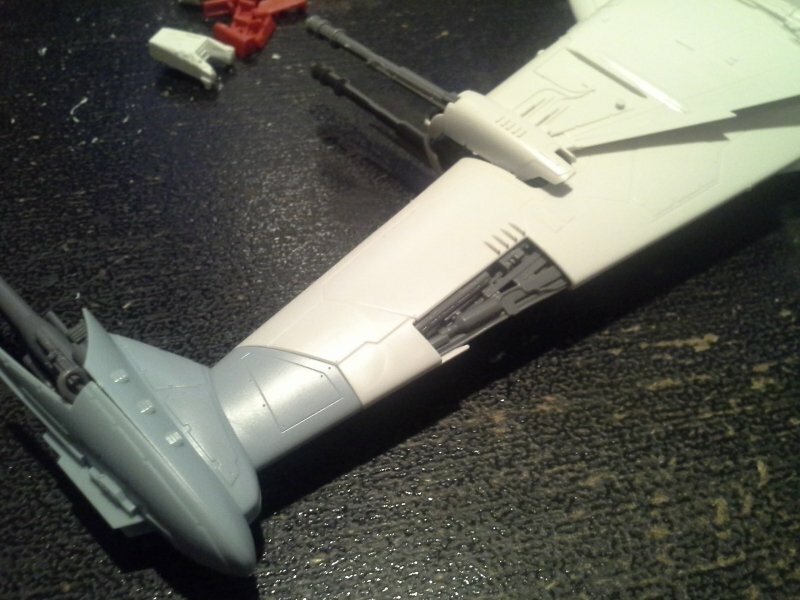 I'm actually considering scratch-building an actual 1/72 A-wing to match the rest of the fighters though, possibly by some mix of kit-bashing and 3D printing. 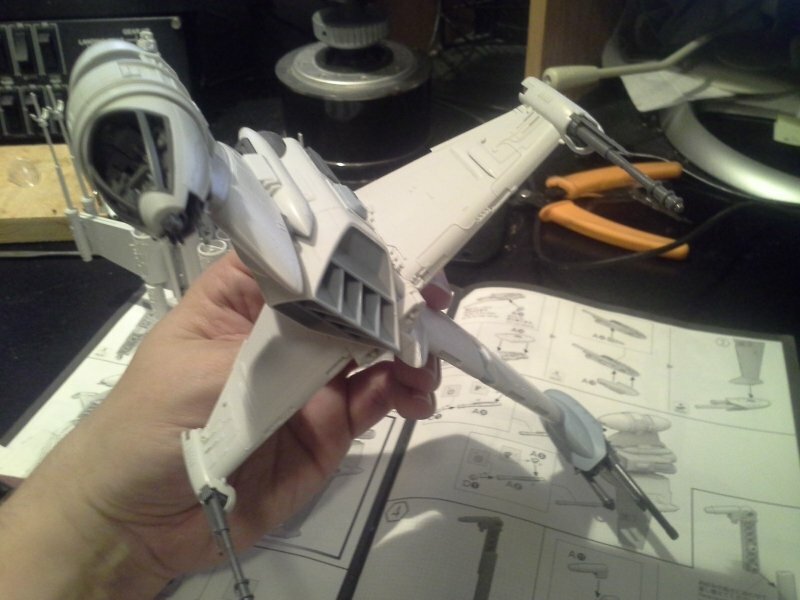 Here's an interesting factoid... the "1/72" Bandai A-wing is scaled properly to be kitbashed from 1/72 F-14 and F-16 kits; it's nearly an identical size to the 1/72 F-14 on my desk. 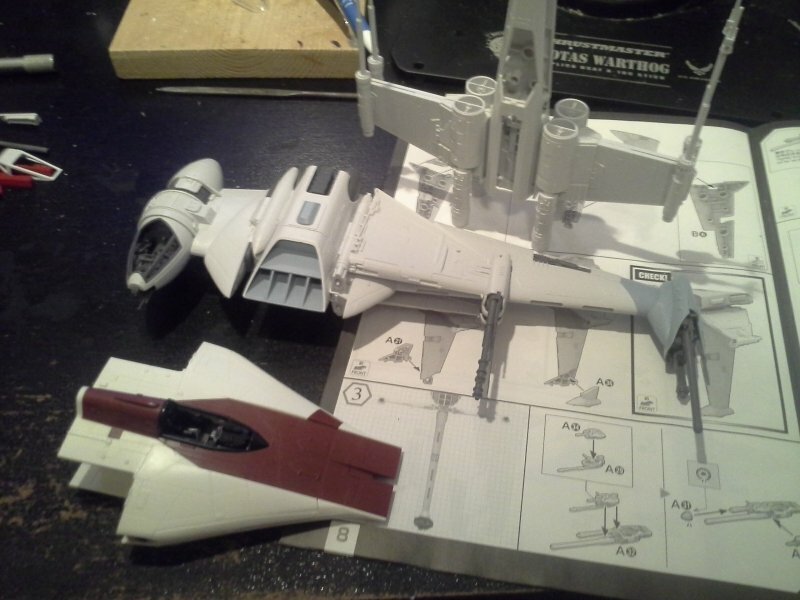 Since I'm fairly sure the source kits for the studio models were 1/32 F-14 and F-16 kits, that makes them 1/2.25th scale replicas of the original studio model.. making the studio model around 11.8 inches long... or, roughly the exact size of the old POTF A-Wing toys. On the flip side of that though... 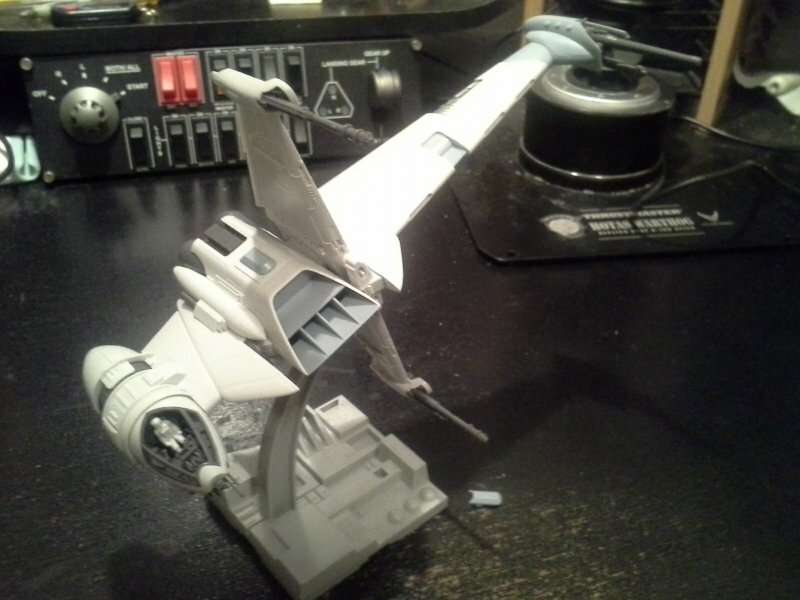 So, if the current "1/72" kit is actually 1/48, that means the A-Wing was about 21 feet long, making it about 3.5 inches long in true 1/72. 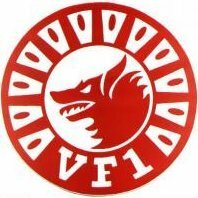 In order to properly kitbash a true 1/72 A-Wing, you'd need parts from 1/108th scale F-14s and F-16s. That's actually close enough that a 1/100 kit would probably work just fine, though. Please stop using translation algorithms. Seriously, just cut it out. You're ruining Skating Storm True! Nice facial likeness on ESB Han Solo. Had to dig a bit for this one, seems like a lot of the merchandise discussion had either died off, or filtered into other threads. 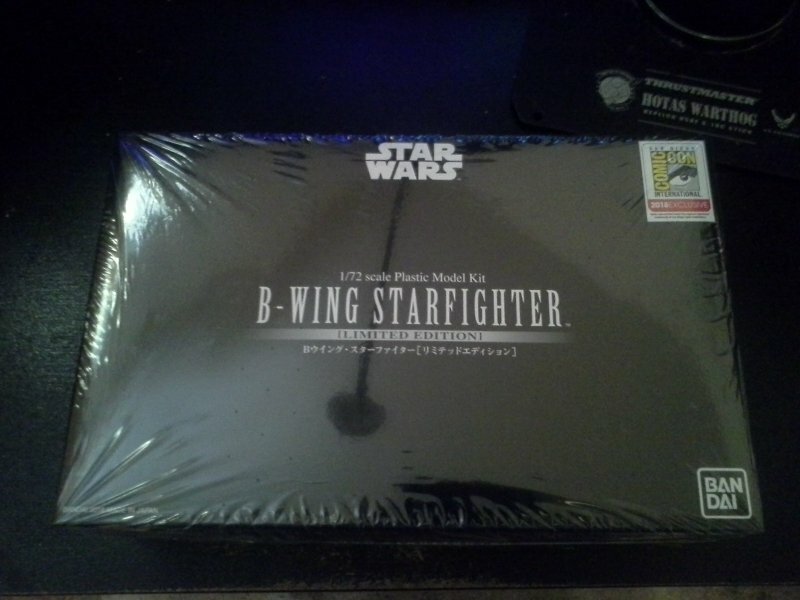 So, because I wanted to treat myself for my birthday, and because I found one on Amazon, I decided to splurge and pick up one of the SDCC exclusive Bandai B-Wing kits. What I did come to discover was that the differences for the exclusive were more than just the little LED lighting kit for the engines. Nothing too fancy, but there are a few alternate parts to replicate the details on one of the alternate filming models, and an alternate pilot figure. I almost felt a little tiny bit bad about opening an exclusive. Almost. Overall, the kit took about an hour and a half to build, give or take 15 minutes spent tracking down itty-bitty parts. This one isn't to the same level of the Y-wing kit by any means, but it's quite a bit more involved than any of the other fighter kits I've built. Lots of tiny parts, and lots of fragile probes sticking out of various assemblies. 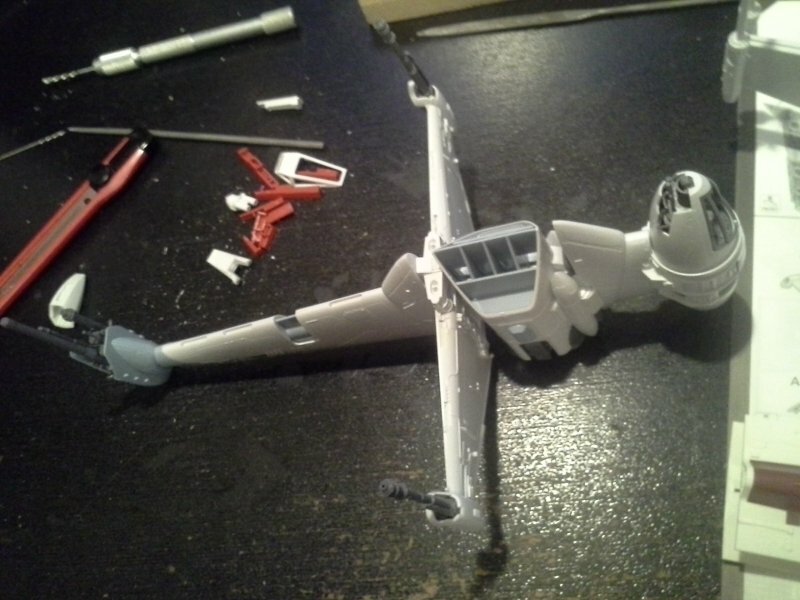 Fortunately, the assembly order can be tweaked a little, and the cockpit and lower weapons pod are both easily detached while you work on the rest of the kit. Length came out to a little over 9 inches, so it's a good sized kit for 1/72 scale (or is it?? more on that at the end). Comparatively, the X-wing's wingspan only reaches from the lower pod to the engines. So, in terms of quality... I think either they're slipping a little, or the nature of it being and exclusive means certain things might still be tweaked. Everything goes together pretty well, but there are a few assemblies that took some tweaking before they would mesh, and some oversized pegs that needed trimming before being pressed together. Also, I was disappointed by a few of the assembly methods, which I think they could have done a better job of hiding seams. The rear half of the cockpit pod, and the big seam all the way around the front intake duct are particularly noticeable. Bottom line, yes, it goes together well out of the box, but it will take more work than some of the other kits to really shine, including a decent amount of gluing, sealing, and sanding certain seams. 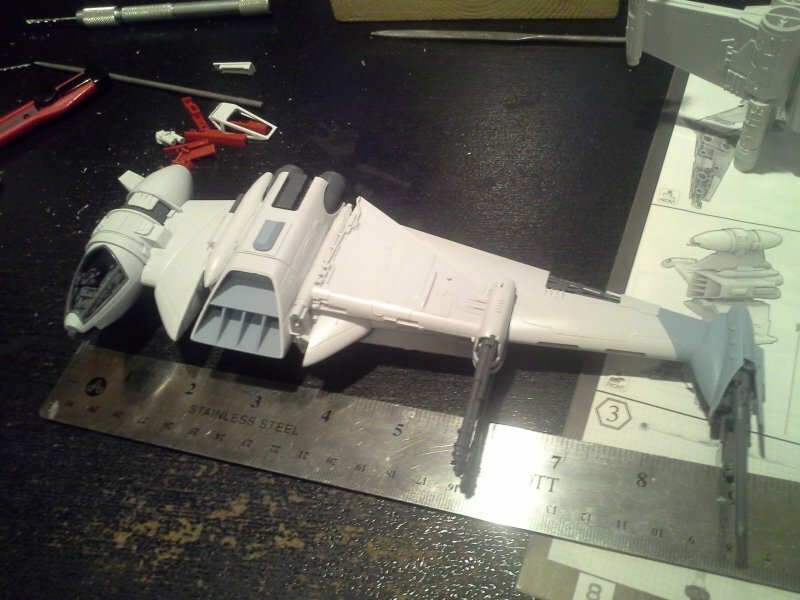 The exclusive version came with an alternate pilot, a small LED pack that can be mounted behind the engine bulkhead to illuminate them, and alternate hull plating to expose this particular bit of the lower wing. Interestingly, the exclusive version does not include the large orange circular squadron markings usually seen on B-Wing photos, so I'm assuming this kit is meant to represent what I understand is the second filming model (I think there were only two). I give up. If I could do it, I'd go back in time and slap whoever decided the "sizes" of all these craft, and scale them based on something visible in the movies. Yes. THESE ARE ALL SUPPOSED TO BE 1/72 SCALE. From left to right, that's A-Wing, X-Wing/Y-Wing, and B-Wing. I would have absolutely no qualms calling these 1/48, 1/72, and 1/100. To be fair, the B-Wing works better than the A-Wing. There is plenty of room in the B-Wing's cockpit pod to fit the X-Wing pilot, with some minor tweaking. But seriously folks, you're not fooling anyone. I'm just resigning myself to the fact that outside of garage kits, we're never going to get Star Wars ships in anything close to a consistent scale, as long as they keep clinging to those "official" ship sizes. Anyhow. There she is. I'll be buying at least two or three more once the normal kit is released. As a side note, the stand is... nothing like any of the other stands for any of the other ship models. If I understand correctly, it's actually a figure base with a special attachment to plug into the back of the ship, because the base itself includes a pair of claw-like grips that would probably function as a waist clip. I might have to see about making a different stand that'll let me mount it on the standard Death Star surface plates, just for consistency. Bottom line, it took way too long to finally get a respectable B-Wing kit. Thanks for the review! I have the SDCC exclusive as well. Bought it from BBTS, but I haven’t opened it yet because I’m moving. Yeah the A-wing is REALLY off...Yikes! Thanks for the review and the photos! So the kit is actually only slightly larger than the old MPC version? I still think that with their density of details, these kits could easily be blown up to 1/48 size. Thanks for the review! I've been eagerly awaiting this to be released as the normal kit! 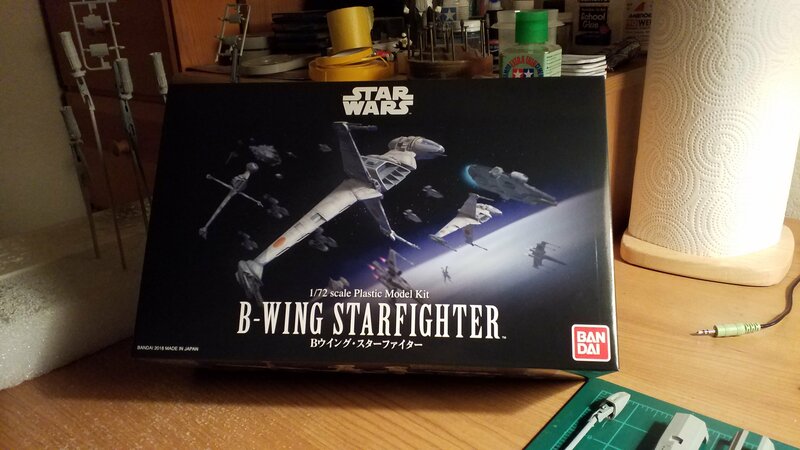 Can't wait to have a good B-Wing! Yeh, I have noticed on the last couple of Bandai Star Wars kits I've done, the quality is a tiny step down from what it was originally! The scales are laughable! I wish they had done all the ships as 1:48!!! I never picked up the original MPC B-Wing, so I can't compare it directly, but I was under the impression that it was quite a bit smaller, closer to the size of the MPC Y-Wing kit. Have to agree though, most ships in Star Wars are smaller, and having everything in 1/48 across the board would be a huge improvement. Considering the A-Wing is already there, it would just take two more kits. 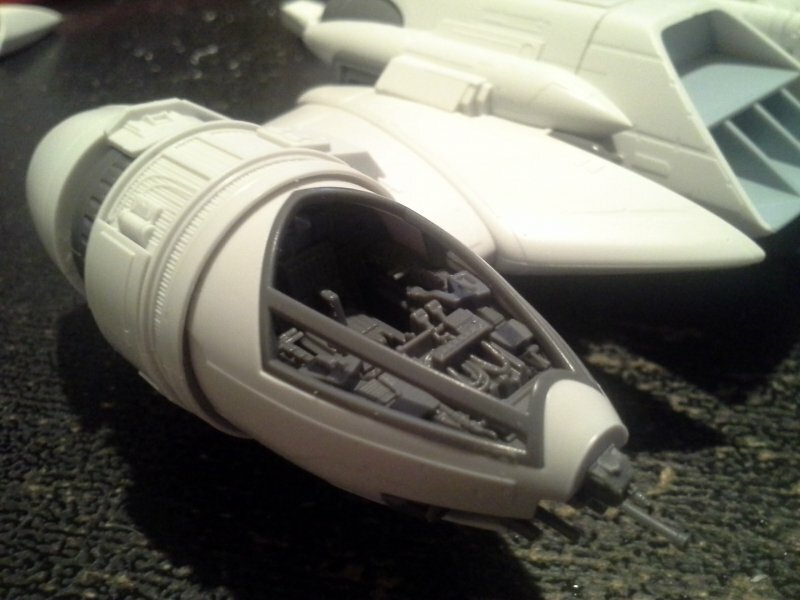 It would also make the Y-Wing much easier to manage, because all the tiny bits on that kit are microscopic in 1/72. Far as the molding goes, the quality is still there, but this one feels like it suffers from some bad parts breakdown design. It's very minimal at least, the only really obvious problem I had was the giant front intake, which is just going to take some TLC (aka glue and sanding) to get mounted nicely, and minimize the gap. The issue is that the whole intake is a giant block with a solid back surface that mates up with another solid surface on the front side of the engine block. The pegs on the front of the engine block were oversized, and because the back of the engine block is an open tube for the nozzle assembly, there was no good location to apply pressure to push the intake into place. What they should have done was leave the front of the engine block open, add a mounting collar to the back of the intake block, and then sandwich it between the fuselage halves to hold it in place. What they have is by no means terrible, but it could definitely be improved. The Bandai kit is a bit larger than the old MPC kit but smaller than the 1/72 Fantastic Plastic Resin kit. Someone at SSM posted these comparisons. 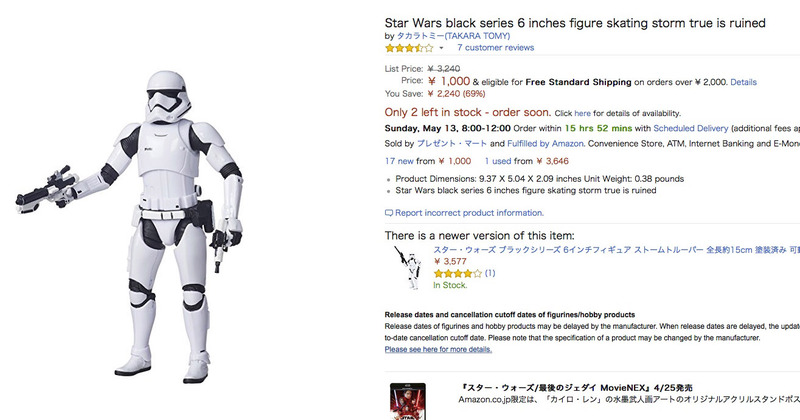 Looks like the Bandai kit is as good as 1/72, just the pilot is undersized. When't the normal release coming out? I thought I had read August a few months back??? I think that's still accurate, but we should all know by now that August 31st still counts as August for Bandai. I don't think the pilot for the B-Wing is undersized though, it looks right compared with how big the pilot figure in the prop was. Remember, the "official" measurements for the A-Wing and B-Wing are complete asspulls. The only reason the X-Wing and Y-Wing sizes are so solid is because they actually built full-sized versions for the hangar scene in ANH, and they all had visible R2 units, which are a fixed size. 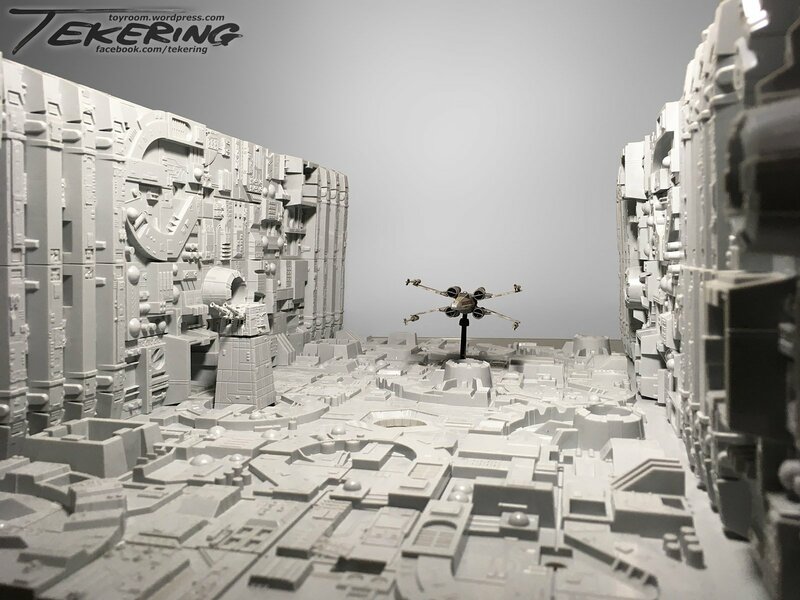 The A-Wing and B-Wing never got anything more than matte paintings, and the one painted B-Wing isn't shown well enough to measure it compared to any surrounding details. 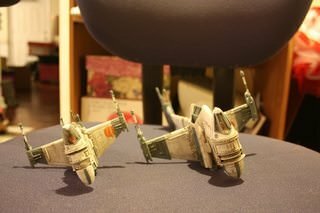 There are only so many sizes that the film models of the A-Wing and B-Wing can be, because of the components they were kitbashed from. The B-Wing's s-foils are F-18 prototype wings mounted backwards, the pods under the cockpit are F-14 external fuel tanks, and I'm pretty sure a lot of the cockpit pod was built from a Space Shuttle fuel tank. 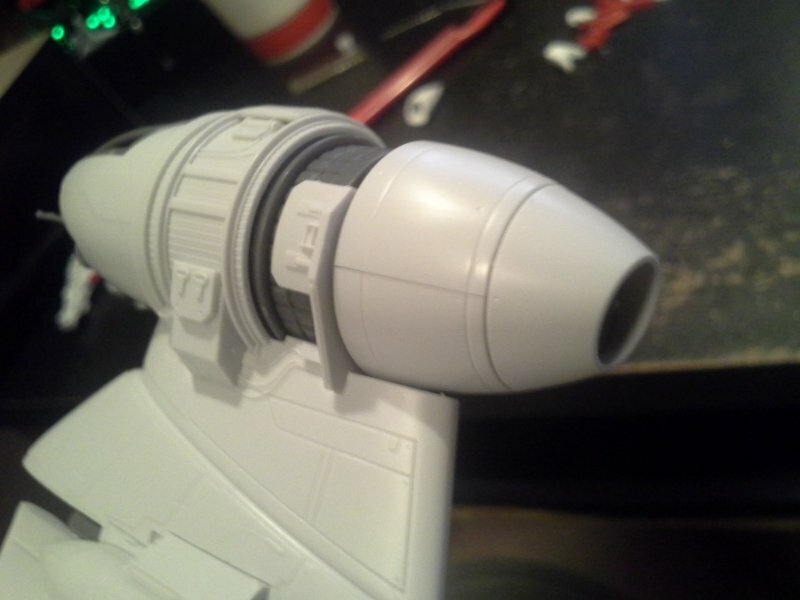 I've only ever seen full stack Space Shuttle kits in 1/144 and 1/72, so that pins down two sizes for the cockpit pod, and I'm not betting they used 1/144. The real tank is 27.6 ft in diameter, giving you a diameter of 4.6 inches in 1/72 scale, which sounds about right to me. 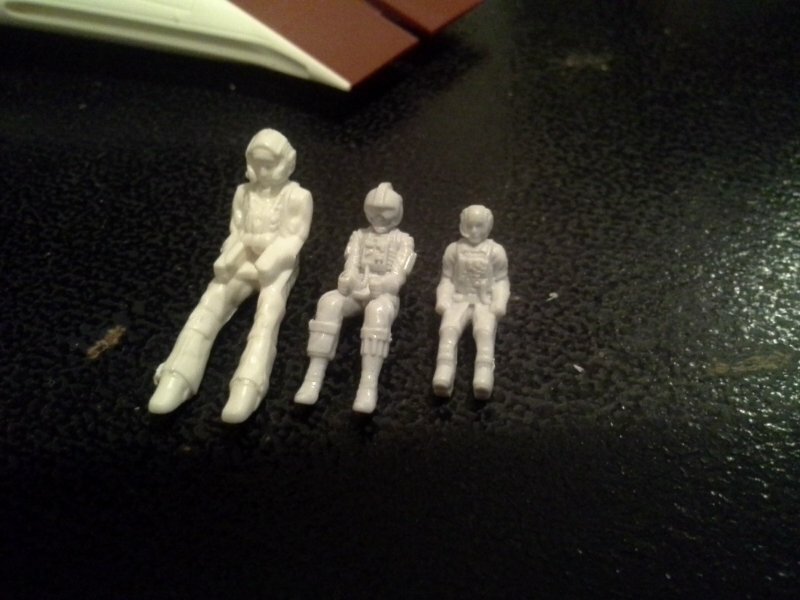 Based on the proportional size of the pilot in the model looking a little over an inch wide, it looks like the figure is probably around 1/25th, which is kind of the standard figure that got used in a lot of the ship models. I'm pretty sure the original X-Wings in ANH used NASCAR driver figures in the cockpits. Anyhow.. I could get way too in-depth with this. Suffice it to say, the official measurements are nonsense, and I'm pretty sure the Bandai kits are designed as visual replicas of the film models, before everything is scaled to the official size, including the pilot. 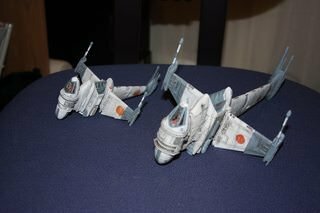 Oddly enough though, that actually probably gave a better estimate of the A-Wing, and the Bandai kit looks more reasonably sized (in 1/48th) than the film model. The pilot in the A-wing studio model was huge, and all that stuck up in the canopy was his head. 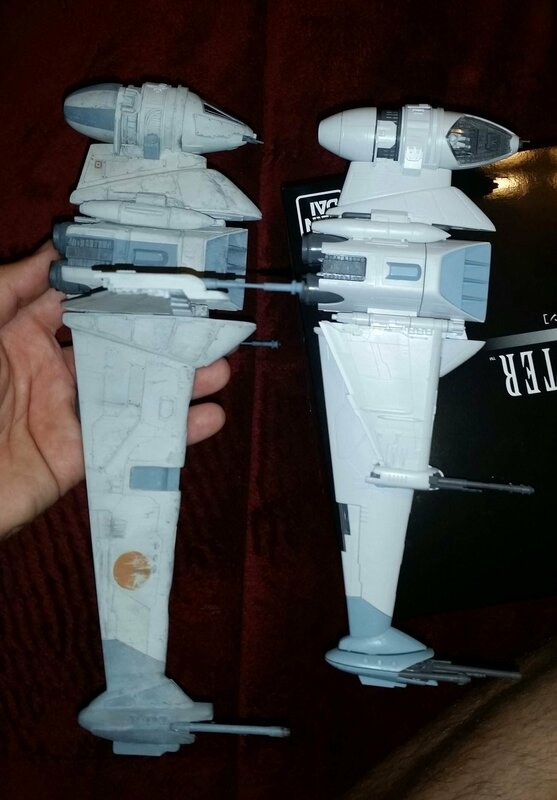 The size in the Bandai kit looks much closer to how the shots of pilots in A-Wings looked in the movie. Small thing I looked over entirely while building. There is a standard socket for the normal stands included in all the other kits, I just snapped on the cover plate without looking at it closely. it's hidden beneath one of the small turquoise panels on the engine block. Obviously can't get an upright pose with it due to the position and height, but still looks a lot better alongside the other kits than the big upright stand this kit came with. Hey, this is in a galaxy far far away... People come in all different colors, maybe they come in different sizes too! Digging this thread out for an update. So, I took a chance, and it payed off majorly. Remember how I'd been wishing Bandai would just release a pack of Death Star panels? Well, they pretty much did. I had read a review of this kit some time ago, and someone mentioned that they weren't the same panels as the other kits, and were scaled down for the 1/144 ship collection. I'm very happy to report that this review was incorrect. The box is literally just a pile of the stand base sprues from the other kits, including all of the pedestals, adapters, and extra bits. 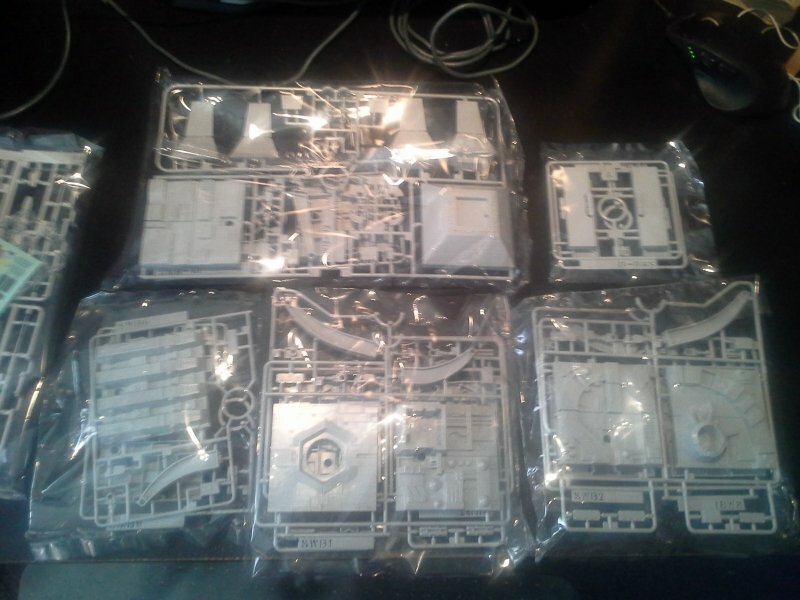 From top left to bottom right: A-Wing and Tie Interceptor stand sprues, with one turbolaser tower, one small bag containing four corner brackets to make 90-degree bends to make a trench and two mounting blocks for smaller ships, one bag of two Y-Wing stand sprues, and two bags that each contain a full X-Wing stand base and exhaust port, plus one each of the bases from the Tie Fighter and Tie Advanced kits. Grand total of twelve panels, plus the turbolaser tower. Off to the edge of the picture is the bag with the included 1/144 X-Wing. The kit only appears to have included stickers, but you do get markings and painting instructions for Luke, Wedge, and Biggs, which is nice to see, and could easily be used as a guide for painting the larger kits as well (minus the decals, which they don't seem interested in producing in 1/72 ). There's a clear stand included that can either be used on a separate base (included), or one of the two adapter blocks that can be mounted in the usual pedestal mounts on all of the baseplates. There are just enough baseplates to make the example configuration on the box, plus have one leftover exhaust port. The real benefit here though is that you also get a ton of spare stand pedestals, which can be used on the Red Leader and B-Wing kits, since they came with different stands. What I'm really happy about personally is that the kit also included one of the Tie-specific stand adapters that plugs into the hexagonal exhaust port, rather than underneath the ball. Those adapters were developed after the regular Tie Fighter, and only included with the Interceptor kit, and I think they just give a better mounting position for the Ties. 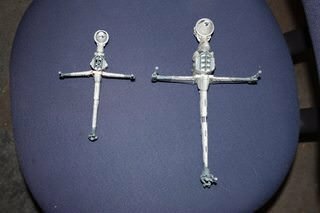 I ordered a pair of these kits, both for spare bases and to make an actual expanded trench display. Between these two, and the Red Leader X-Wing kit, I'll have 3 of the X-Wings to mount, and enough panels to build a dual-walled trench. I saw that set somewhere on line the other day and almost bit! In other news, my BWing should be arriving today! someone mentioned that they weren't the same panels as the other kits, and were scaled down for the 1/144 ship collection. I'm very happy to report that this review was incorrect. I'd say even 1:144 is generous... but it's impossible to determine the actual scale these Death Star panels represent. I bought four sets myself. Oh, yeah, the scale is non-existent. I just meant an early review had said that the baseplates were scaled down for the kit. That definitely ain't no "two meter" exhaust port. The double-panel wall height does look about right though. I might need to pick up a couple more sets sometime down the road. I do wish there was a way to get actual in-scale turbolaser towers though, That still looks less than half as big as it should be compared to the ship. Woooo! Grats, and enjoy building! Have to admit, much as I liked getting the SDCC version, I missed having actual box art. 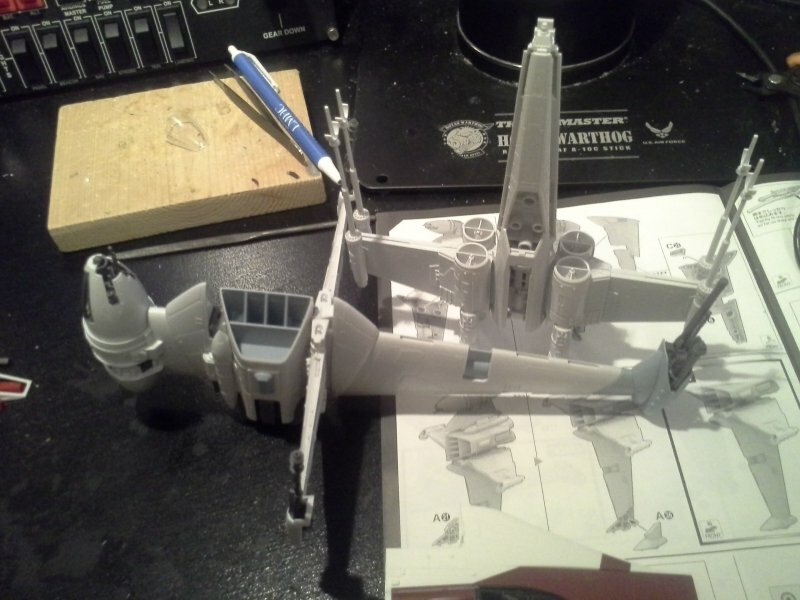 There's a pretty awesome WIP on Britmodeler, showing how impressive the kit is. 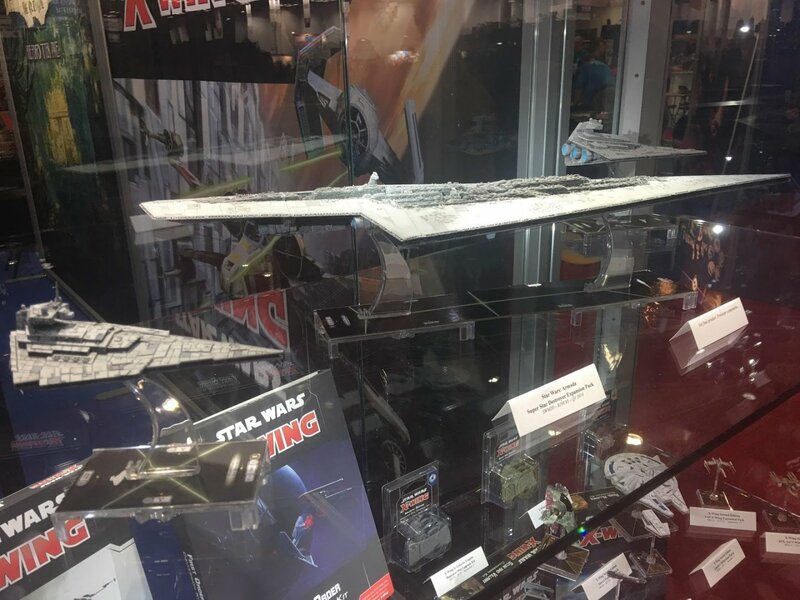 Fantasy Flight Games is making a 24 inch Super Star Destroyer for their Star Wars Armada game. That will put it close to the right size with the Bandai Mecha Star Destroyer. 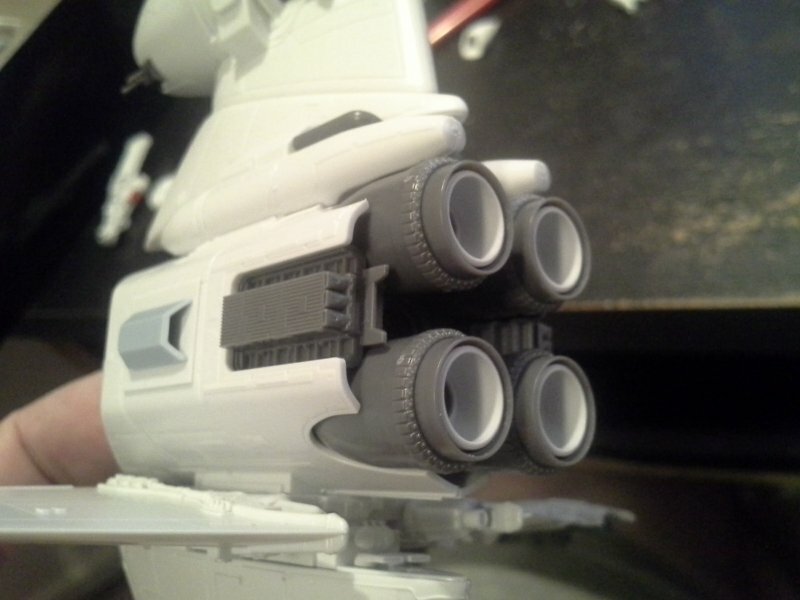 Hope they fix the engine paint before actual release---bright BLUE exhaust on the Executor? I didn’t even notice that. You’re right. Easy enough fix for me though, but but for $200 it should be right. Is it just me, or are all these Disney movies starting to look the same? 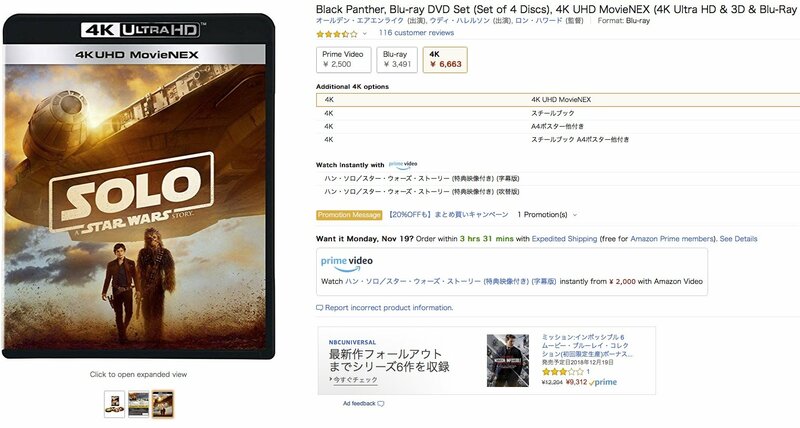 And this is the cover for Black Panther UHD set.